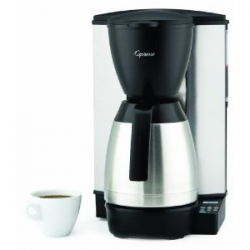 The Capresso MT600 coffee maker with stainless steel thermal carafe brews 10-cups of coffee in under 8 minutes for maximum flavor and aroma. The milled steel housing provides superior strength and style. 10-cup stainless steel thermal carafe with ergonomic handle, brew-through closed lid with drip-free pouring spout keeps coffee hot for hours and preserves aroma. Stainless steel lined heating system eliminate contact with aluminum and reduces the need for decalcifying. The included gold tone filter is easy to clean and eliminates the need for paper filters. Drip stop allows you to pour a cup while brewing. Charcoal water filter removes up to 82-percent of chlorine and other impurities from tap water. One charcoal filter and holder is included. Illuminated 24-hour programmable lcd digital clock/timer with soft touch controls. Special setting provides maximum aroma when brewing 3-5 cups. An electronic filter indicator shows when to replace the charcoal filter. Electronics retain all programming during short power outages.